You might just live in the southern part of the United States, and raise hogs, if your latest addition to your cookbook collection looks like this. You mean not everyone buys cookbooks like this? 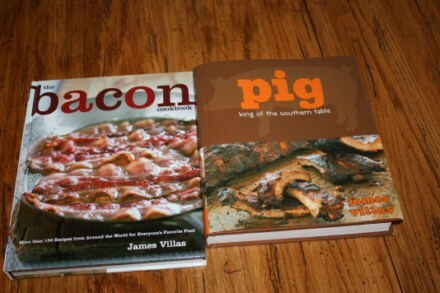 I am sure I am not the only one with The Bacon Cookbook and Pig: King of the Southern Table as part of their cookbook collection. Am I? Okay so maybe I am, but look at all the new ideas I have for using up my pork. I had no idea you could use bacon in so many ways, until I looked through these cookbooks. Nor did I know that you could use so many different “parts” of the hog. Let’s just say I will not be trying some of the recipes in this book. There are some parts of the hog that you should just not eat and I will leave it at that. 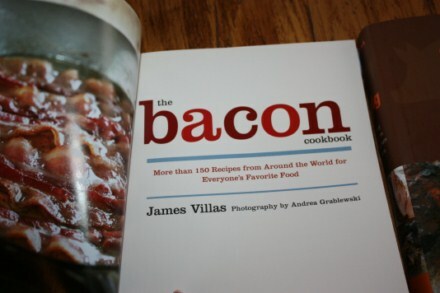 I didn’t realize there was a whole cookbook about bacon. 🙂 When I was a girl we raised hogs. At one point we had 500. I always loved playing with the babies. @Jackie, 500! Okay I hope we never have that many hogs. 🙂 The few we raise is plenty. 🙂 My kids do love having them though. 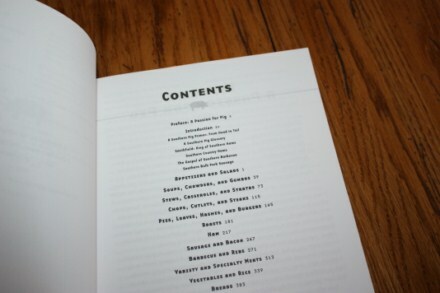 And yes the bacon cookbook is a nice one. @Lynn, Well, we went from 500 to zero pretty quickly. My dad changed careers and became a professional photographer after the bottom dropped out of the hog market. (He’s a pastor now.) My husband and I have never raised hogs, but did raise laying hens for several years and sold the eggs. Our grocery store has a natural foods freezer (pretty low natural food selection out here) and they will sometimes put their natural bacon pkgs. on sale for $1 so I grab them up and spend a little time batch cooking bacon and last night I used up the last of my supply- I micro cooked two packages of frozen boxed spinach, meanwhile I sauteed the bacon with some mushrooms and garlic and then combined that with the cooked spinach, was soooo yummy everyone ate their portion and asked for more! !